It is a beautiful day in Kaiapoi. The sun is shining, there is not a cloud in the sky, there is a gentle cooling breeze and I have been to the local farmers market to buy the delicious bacon from the pork lady. I also found the fresh leeks, tomatoes and courgettes irresistible. Now I am home, the shopping packed away and my thoughts have turned to what I can cook for tonight's dinner. I purchased some dried fruits from the supermarket during the week and the goat leg I was given by the good friends that are coming for dinner, has been in the freezer long enough. North African tagine is flickering in the food centric part of my mind. All is well with the world......except that for the first time this year there are flies about. Canterbury has been unseasonably cool this summer. Or I should say “it has been unsettled, being warm for a few days followed by a few cool days.” The flies haven't known whether they are coming or going; until now. I don't think they are North African flies that have smelled the lamb simmering in the spiced juices of courgette, tomatoes, etc. etc. I fear they are common house flies and blow flies that have suddenly taken the opportunity to emerge due to the warm weather. It is maybe my fault that they are coming into the house. I have all the windows and doors open, including the ranch slider to the balcony. But the flies don’t stay long. I recently sprayed all the fly landing surfaces with NO Bugs Super Professional Strength. What I don’t have is a Robocan or Natugard type dispenser. I don’t need it after spraying the surfaces. And as I am into cooking I don’t want the spray anywhere near my food. Not that I think that there is anything wrong with Robocan or Natugard dispensers. I don’t. But they have to be placed in the ‘right’ place, and only in the ‘right’ place. Such dispensers should never be placed near food or places where food is handled. I probably will purchase a dispenser and use a Kiwicare AutoCan 100% natural pyrethrum refill, but I will place the unit well away from the kitchen and switch it off when I am spending time in its vicinity; I don’t want to be breathing the insecticide, no matter how natural. My advice to you if you are experiencing a problem with flies is carry out a thorough interior and exterior treatment with a long lasting residual insecticide such as NO Bugs Super or NO Flies. You can find out how in a previous Pest Advice article on how to use surafce insecticides. You can use an automatic dispenser as well but remember not to place it near food or food preparation areas. Time for my tagine with couscous and tamarind pickle. No flies allowed. One night when I was 10 years old I was woken by my mother who asked me to help catch a mouse that was terrorising her and my father in their bedroom. Wearing only my pyjamas I entered my parent's bedroom to find Smokey, my terrier, frantically running around the bed, his tail in a blur of excitement. My father was lifting various pieces of furniture under which the mouse had darted. The mouse was quick. Despite Smokey's best efforts he couldn't catch it. The mouse always found somewhere the dog could not go. Then the mouse shot out from under the dresser that I and my father moved. It ran to the window and ran up the back of a curtain. Smokey stood to attention, eyes fixed on the curtain and emitting a plaintive frustrated whine. I took hold of the curtain and shook it in the hope that the mouse would drop and Smokey could pounce. The first part of the plan worked well. The mouse dropped to the floor. But before Smokey could react, the mouse had found another dark enclosed space to hide; my pyjama trouser leg. This came as something of a shock to me. I am not a natural dancer but I think I did a version of an American Indian rain dance as the mouse ran up one trouser leg and thankfully down the other. My parents were no help. They were helpless in fact. Helpless with laughter. This confused Smokey. He was so busy watching them that the mouse, on leaving my bed time garments shot out the door and was never seen again. "Poor mouse" said my mother. "Poor mouse?" I said. "What about me? I could be scarred for life." Some would say I have been. Perhaps that is why I ended up in pest control. I've had it in for that 'poor' mouse ever since. I don't suggest this route to a career in pest control. I would suggest the alterantive route of doing the Open Polytechnic Certificate in Urban Pest Management or if you want to work on pests in the countryside, a National Trade Academy course or contact the National Possum Control Agencies. Good luck and don't forget to tuck your trousers down your socks. As mentioned in my previous articles on how to "Stop Ants Pestering You This Summer" and "Argentine Ants" the other species of ant that are likely to be pests in New Zealand are Darwin Ants and White Footed Ants. Here you will find a little more information on their biology to help you control them more effectively. Darwin Ants are small (2-3mm) dark brown ants that have become established in New Zealand as far south as Christchurch. They are pests of our homes, shops and other buildings but there is little evidence yet that they are a threat to New Zealand’s natural ecosystems. Darwin Ant distribution is rapidly expanding and they may form 'supercolonies' in a similar way to Argentine Ants; with many nests part of the same colony and workers from one nest moving freely from one to another; cooperating. Darwin's Ant came to NZ from Darwin in Australia and has found the environment in NZ to its liking with few competing insects and predators. In NZ it forms much larger colonies than in its native Australia. Darwin Ants can be distinguished from a similar looking Argentine Ant. Darwins have a pungent smell when squashed where as Argentines do not. Darwins normally follow each other in single file where as Argentine ants will have a trail many ants wide like a 'motorway'. Identification is important to control ants, as methods can be tailored to the ant species involved. Incorrect control methods may only serve to exacerbate the problem as in spraying an Argentine or Darwin ant colony with insecticide before carrying out baiting and using barriers to stop spread. For Darwin Ants follow the instructions in the "Stop Ants Pestering You This Summer." And take note that you will find that Darwin Ants generally prefer Kiwicare Liquid Ant Bait to the gel bait. As Darwin Ants are likely to have muliple nests in your garden. Try and identify all the nest sites and treat all after baiting as described. White Footed Ants are common pests in New Zealand homes and gardens. Numbers can get very high in conditions that suit these ants. Some colonies or nests may exceed a million individuals. These small dark ants look similar to Argentine Ants and Darwin Ants to the naked eye but can be identified by the pale ends to their legs; you may need the aid of a good lens or microscope to see this. They are often found climbing trees and walls and will readily infest upper floors of buildings. In general the control of White Footed Ants is the same as for other ant species. Follow the instructions in "Stop Ants Pestering You This Summer." However, White Footed Ants can be more difficult to control using baits because of their habit of feeding larvae and queens a sweet secretion from their rear rather than the food that they feed on directly. This means that baits are already processed or the workers are dead before they have a chance to feed the rest of the colony in the nest. The reduced effectiveness of baits means that more reliance on contact insecticides and barriers is needed to control these nuisance ants. Why are ants always so negative? Because they are so anti. I watched tonight's TV3 episode of Target with some horror. I am happy to say that the pest control professionals that I know are far above the level of the companies tested on the program. If you are looking to pay for a pest control technician to treat your property for any sort of pest Kiwicare strongly recommends choosing a Pest Management Association of NZ (PMANZ) registered company and technician. The shocking program does illustrate why so many people chose to solve problems like fleas by doing it themselves. I am happy to say that you can do all that a professional pest control technician can do to get rid of fleas yourself. Follow the instructions found on the Kiwicare website on the Flea Control Page and you will soon be rid of the parasites. What do fleas cross the sea in? In my last post 'Stop Ants Pestering You This Summer' I described how to get rid of ants and how to keep them away. The method described will keep ants out of your home for all the pest species of ant found in New Zealand. However, and this is where it gets complicated, different species of ant are more or less susceptible to this standard treatment and some may be difficult to eradicate. A new invader, Argentine Ants, pose particular difficulties. I will try and describe the habits of the three major pest ant species found in New Zealand; Argentine Ants, Darwin Ants and White Footed Ants, with advice on the additional control methods for each. I will start today with Argentine Ants as they are the most difficult to eradicate. Argentine ants are very aggressive insects. Although they are not poisonous they do bite people and they are regarded as a major threat to the biodiversity of New Zealand as they are capable of eliminating other types of ant colonies and also destroying and eating other insect species and earthworms. Unlike the nests of most other ant species, Argentine Ant colonies co-operate with each other and combine over the winter into 'super colonies'. Argentine Ants are a common household pest and are becoming more common. They often enter structures in search of food or water (particularly during dry or hot weather), or to escape flooded nests during periods of heavy rainfall. Argentine ant nests have many reproductive queens, up to 8 per 1,000 workers. Eliminating a single queen does not stop the colony's ability to breed. When they invade a building, it is common to see two or three queens foraging along with the workers. This habit also makes Argentine ants easily spread by the movement of items such as plant pots, boxes, vehicles etc. on which ants have been foraging. It requires as few as one queen and 20 workers to set up a new nest. Argentine ants are generalist feeders and depending on the diet required by the colony, they will take carbohydrate, protein and sometimes fat. Kiwicare's NO Ants Gel Bait is generally better suited to this ant species than liquid bait as it contains a large amount of carbohydrate, a good dollop of protein and small amount of fat. Argentine ants tend to forage carbohydrates all year long, but also target protein in the spring and occasionally fats and oil during the year. They tend to feed protein foods to the larvae and Queens in the nest and so protein baits are more effective for control of whole colony. How To identify Argentine Ants? The best way to tell Argentine ants from other ants is by their colour, trails and lack of smell when squashed. The wingless worker ant (most commonly seen) is light to dark honey brown and 2-3mm long (most other common household ants in NZ are black). Argentine ants are highly active in searching for food. Their trails are often five or more ants wide and can travel up trees and buildings. Most other species of ants in NZ don't tend to climb trees (White Footed Ant being an exception), and would not have such strong trails unless they were moving a nest (in which case you would see ants carrying their eggs). Argentine ants look very similar to another pest species called Darwin Ant. However, if you squash an Argentine ant there is no strong formic acid smell as there is with some other ants including Darwin Ants. If you wish to make a more formal identification of ant species check ou the excellent Landcare Research Ant Key. Where have they been found? Argentine Ants were first found in Auckland in 1990, more recently they have been found in Northland, Waikato, Bay of Plenty, Wellington, Nelson, Blenheim and Christchurch. Although they breed prolifically they do not swarm (fly off to establish new nests). This means they do not spread very rapidly (except when foraging queens are carried in boxes, pot plants, vehicles etc.). But when a site is infested it will have a very high number of ants and colonies. Their natural rate of invasion is a few hundred metres per year, however their main way of spreading into new areas is via transported nests and/or queens which often happens when plants or other garden materials are moved. The foraging queen ants and workers may also be transported in vehicles. Why are they a threat to NZ? Left unchecked Argentine Ants will become a major household and garden pest. Their huge numbers (up to six nests per square metre) mean a huge appetite and they will utilise just about any food source they can find. They have even been known to make their way into refrigerators, microwaves and screw top jars! In California they are considered to be one of the worst household pests. Argentine Ants threaten native invertebrates as they are very aggressive and kill or drive away other insects. They climb trees and can kill baby birds in the nest. They are also active foragers and compete with other species that feed on honeydew or nectar such as insects and birds. Argentine Ants 'farm' populations of aphids, scale insects and other pests that produce honeydew. The Ants protect the sap sucking insects from predators and will even move them to new plants or to new parts of the plant. This is a particularly serious threat to organic grower and growers using integrated pest management, who rely on predators to control these pests. Argentine ants have also been reported to feed directly on fruit crops and their mass numbers can damage flowers thereby reducing fruit set. They are one of the worst citrus pests in Australia, and a serious pest of viticulture, avocado and tomato crops. Tips for controlling Argentine ants around your home. Contact your local authority, they may have specific requirements for control of Argentines in your area. Argentine Ants are difficult to deal with because of their 'fussy' feeding habits. Remove or securely store food that is favoured by ants. Clean surfaces with lemon juice, soapy water or diluted eucalyptus or tea tree oil. Argentine Ants may be 'farming' aphids and scale insects on trees and plants in your garden. Spray these plants with garden insecticide such as Super Spectrum, Carbaryl Insect Control and/or Organic Super Spraying Oil. Trim trees near your home to reduce ant access to your roof or window areas. Use Kiwicare two-sided tape or chalk dust around tree trunks to discourage ants (especially where birds are nesting. NO Ants ready to use trigger spray. It will be necessary to reapply barrier after rain fall (if outside) or every week (if exposed to direct sunlight). Thoroughly spray/paint all entry points into the home. Reduce moisture sources (e.g. : leaking taps, irrigation) as Argentine ants prefer moist conditions. Keep your roof gap and sub-floor dry and well ventilated to discourage ants from nesting there. In winter you may be able to follow the ant trails back to the colony. If you can find this colony you may be able to kill it with Lawngard Prills or NO Ants Spray. But be careful not to encourage the colony to 'bud' i.e. move to a new nest site or sites. Contact your local authority or email Kiwcare for more advice. DO NOT try and spray generally for ants, as this may encourage new nests to 'bud off' from the main colony and could worsen the situation. The next post will describe Darwin Ants and White Footed Ants. Are ants pestering you in and around your home? With summer and the warmer weather, populations of ant nests rise and they become more active. Ants are often found invading our kitchens or marching across our decks in search of food, our food; the sandwich we innocently left on the breakfast bar or the glass of coke on the barbecue. With a little effort and some products found in good hardware stores there are ways to get rid of these pests and keep them away. Begin by taking a good look around the inside and outside of your house. Make a note of where you see ants. If you find trails of ants follow the ants that are carrying food; they will lead you to the entrances of nest sites. Mark the entrances so that they can be treated later. Do not spray the nests with insecticide yet! Spraying the nest with insecticide will only serve to spread your problem. The ants will often just move to another site. If the colony is a multi-queen species this will mean multiple new nests. To make it easier to see the ants carrying food you can sprinkle fine bread crumbs on their trail. Most often the nest is outside in sandy soil under paving stones or in cracks and crevices. Nests are usually on the sunny warm side of the house. Ants like warm dry nest sites. Your first treatment should be using ant bait, either Kiwicare NO Ants Gel or Liquid Bait. a. Place the bait everywhere ants have been seen travelling. The more bait points you set the more bait will be taken back to the nest and faster more effective control will be achieved. Use either Ant Bait Stations or place bait in clean containers such as bottle tops. The worker ants collect this bait and take it back to their nest where they feed it to the queens and larvae. b. Ants change their feeding habits depending on the needs of the colony; sometimes preferring sweet sugary bait and sometimes they want more protein. Kiwicare liquid ant bait is sugar based and the gel bait has a high level of protein. If you notice the ants are not feeding on one bait, change it for the other type. c. Replenish the bait regularly so that there is always fresh bait for the ants. 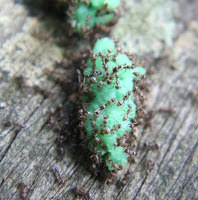 Continue until very few or no ants are seen feeding on the bait. This may take up to two weeks in heavily infested areas. Now you can spray the interior surfaces with Kiwicare NO Ants or NO Bugs Super. Ants that walk over this insecticide surface spray will be killed, but trailing ants detect insecticide and will avoid it, so it acts as a barrier. If ants have been seen in the roof void use a Kiwicare NO Bugs Bug Bomb to treat this area. Now put a barrier around your house to stop the ants from your neighbour’s taking the place of those you have removed. Sprinkle Lawngard Prills on the surface of flowerbeds and gravel or sandy areas around the house and water in. These products slowly release a 'curtain' of insecticide into the ground which acts as a barrier to ants that would burrow their way into your house. Also brush Kiwicare NO Ants Ant Sand into cracks and crevices to deny ants these spaces as new nest sites. For areas where it is preferred that insecticides are not used Kiwicare produces an Organic NO Insects Barrier which does not kill ants but will stop them travelling where it is used. Now deal with the nests. Sprinkle the NO Insects Lawngard Prills where nest entrances have been identified. Routinely maintain these barrier treatments and you will remain free from ant problems in your home. This treatment regime will control the pest ant species found in New Zealand. There are however some interesting differences between the species and how best to deal with each of them. I will discuss this in my next blogs. Have a wonderful ant free summer. I had an interesting question from a Mitre10 store today. One of the staff called with a question from a customer; How do they get rid of worms from a bowling green? The lady from Mitre10 was correct that earthworms are usually regarded as the friend of good grass. After all, earthworms condition soil by aerating and fertilizing as they eat their way through the ground. But for the bowls club the earthworms damage the flat surface of their manicured green, both by undermining the surface and creating worm casts. The worm casts in particular would be liable to seriously influence the direction of a bowl. The bowls club also pay great attention to the condition of the soil under their green. They aerate, fertilize and condition the green directly so losing the worms is not an issue for soil condition. The answer the Mitre 10 query was that the Kiwicare insecticide Carbaryl Insect Control (aka NO Insects Carbaryl 80) can be used to get rid of earthworms. Carbaryl is highly toxic to worms and we usually advise users to avoid using it on soil, but in this case, and others where worms are a pest, it is an effective control method. Earthworms are good.....except when they deflect your bowls. It is normal for the numbers of both rats and mice to increase over summer months to a peak in the autumn. But judging by the continued high sales of Kiwicare rodenticides there are more rats and mice about in homes and workplaces than usual at this time of year. It is not clear what the reasons for this greater than usual explosion of number is, but it is reasonable to assume that the weather conditions over this summer have been suitable for both the breeding of rodents and the food which they eat. What will this mean for the annual autumn invasion of rodents? I think it is likely to mean more rats and mice than usual invading our homes looking for food and shelter this autumn and winter. If you have seen rats or mice, or evidence of them around your property, the most efficient and effective way to get rid of them is to use rodenticide baits sometimes in conjunction with simple traps and proofing. NO Rats & Mice rodenticide bait is placed at strategic, safe points, inside and outside the buildings, in order to reduce populations around the building and to deal with individuals that enter, before an infestation can take hold. The NO Rats & Mice Weatherproof Blocks is a rat bait well suited to using outside or in damp areas while NO Rats & Mice with Tracking Powder is ideal for use in dry areas inside the house. If you do not wish to use toxic rodenticide bait, Kiwicare Natural NO Rats is a bait that is harmful only to rodents. However it should only be used in dry areas where other food sources can be controlled. NO Rats and Mice Traps are useful to use where poison baits cannot be placed or as a helpful way of catching rodents that are 'dopey' from taking bait. The rodents can then be removed without risk of causing an unpleasant smell. Prevent the rats or mice getting in. A mouse can squeeze beneath a door if there is a gap large enough to fit a pencil a young rat is only a little larger than a mouse! Draft excluding brush strips, are an ideal method of proofing such gaps. However, there are almost always other possible entry points around any building. So it is always wise to keep fresh rodenticide bait in place in safe places such as the roof void so that any rodents that get in are dealt with before you know about them. This is an important and often overlooked aspect of controlling pests. For example, rodents are what we would call agoraphobic, they fear open spaces, and like to be under cover. A wide clear area around a building will deter rodents from reaching and entering the building. And the removal of available food and shelter from within a building can have a powerful deterrent effect. Stay rodent free this winter. The difference is in their size or the size of their incisors. Kiwis love their gardens. Here in the garden city, as elsewhere in the country, there is great pride taken in having a beautiful outdoor space. Usually summer weather allows us to use the garden as an extended part of the house. The term 'good indoor outdoor flow' is used regularly when estate agents sell property because the garden is such an important part of our lifestyle. But there are pests out there that would attack many of the plants in the garden, given the chance; aphids, white fly, mealy bugs, plant hoppers, psyllids, scale insects, mites, caterpillars, earwigs and more. All can attack our garden plants. 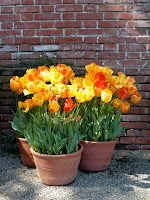 If you are choosing new plants for your garden ask for ones resistant to insect attack and disease. Think about what insects and diseases are likely to attack the plants you have planted. Your garden centre should be able to give you advice. Think prevention. Don't wait until your plants have a problem before acting. You don't have to use chemical insecticides. For example the Kiwicare range includes organic control products such as Organic Super Spraying Oil for the prevention of aphids, whitefly, scale insects, mites and others. Organic Caterpillar Bio Control can prevent the cabbage butterfly caterpillars eating your vegetables. NO Ants Organic Barrier can prevent ants and other insects climbing plants where they would farm aphids. Use chemical insecticides sparingly and think about how they might affect beneficial insects such as lady bugs and bees. There are some varieties of plants such as roses that can be very susceptible to aphids. These should be sprayed carefully with systemic insecticides and fungicides to prevent attack. Kiwicare Spectrum comes in a liquid and powder form for the protection of roses, fruit trees and ornamentals. The powder version is more effective for getting rid of a problem and the liquid form is handy for prevention. Make sure only the susceptible plants are sprayed with insecticide leaving other plants safe for beneficial insects. As well as sap sucking insect pests there are insect larvae in the soil that might attack the roots of our plants. For example grass grub and porina caterpillar attack the roots of our lawns and cluster fly larvae attack the worms that fertilize and condition the soil. Slow release granules such as Lawngard Prills can keep soil insect pest from causing this damage. Look after your garden and enjoy the late summer days in your outdoor room. A woman goes to the doctor with a large flower growing out of the top of her head. Surface spray insecticides are usually what are known as residual insecticides; that is the insecticide remains active and lethal to insects for up to 6 months. Most are synthetic pyrethroids. Pyrethrum is a natural product extracted from the flowers of chrysanthemums. Synthetic versions of pyrethrum are made more stable and long lasting. Surface sprays only affect insects when the insect makes contact with the treated surfaces or if the insect is sprayed directly. This is great for controlling crawling insects both adult and larval. Flies and other flying insects are also controlled because they will land on the treated surfaces. The long lasting effect of residual insecticides means that a treatment can be carried out once and may not need repeated for a whole season. Because the insecticide is limited to the treated surfaces there is no insecticide in the air for people, pets or others to inhale. Think about the pest/s you want to control. Where do they live and what surfaces do they contact? Check out the Kiwicare website for information on the pest/s you want to control. If the surfaces to be treated are dirty or greasy clean them with mild detergent and leave to dry thoroughly. If you are using your own sprayer make sure it is thoroughly cleaned and rinsed with clean water before use. When using a concentrate measure the correct amount of product carefully and mix with clean water to the correct dilution. How to mix spray concentrates. Clear away all foods, food utensils and cover any surfaces that food may contact. Remove all people and pets from the area. Remove or cover fish tanks and ponds. Remove or cover toys and bedding or any other items that are regularly contacted. For exterior spraying choose a still dry day when rain is not imminent. Exterior spraying can be useful barrier to the entry of insect pests such as ants, cockroaches, slaters, flies and spiders. Wear overalls, particle mask, gloves, cap and eye protection when spraying. For crawling insects, pull furniture away from walls so that you have access to skirting and the base of walls. Using a fine spray and a steady motion spray the surfaces to give an even coverage. Do not over spray; the spray should not run. Porous surfaces are likely to need a second coat. If the spray beads on the surface let it dry and then give a second spray. Two light sprays is better than one heavy spray. When spraying around windows avoid over spraying on the glass. It is easier to clean spray off windows before it is dried. A sponge can be a useful way to applying spray solution to window frames and sills without getting product on the glass. Leave the area to ventilate and let the spray dry thoroughly. Wipe down any food preparation surfaces that might have had spray contact it. Synthetic pyrethroid insecticides take minutes to hours to kill insects so don't expect insects to drop dead immediately they contact the treated surfaces. You should now have good long term control of many insect pests. The length of time the spray will remain active is governed by the exposure to UV light, rain, grease and dirt accumulating on the surfaces and how often the surfaces are cleaned down. A fly walks into a bar and sidles up to a woman sitting at the bar and says "I like that stool you're sitting on." In New Zealand from November through to March borer beetles emerge from their timber feast as small brown beetles that fly off to find a mate. The tell tale flight holes in our wooden weather boards, eaves, panelling, skirting etc. look like someone has being playing darts. The flight holes that you can see are likely to be a fraction of the number of flight holes in places you can't see; inside the walls, under the floor, in the roof voids. Ideally the timbers should be sprayed on these interior surfaces with a Borer fluid but in many situations access is not possible. Control of borer can be achieved using NO Borer bombs and fumigators. These products release a vapour into the spaces which knock down adult beetles and stop them laying eggs back on the timbers. Released once (or preferably twice a season) in sub floors, affected rooms, roof voids and other inaccessible spaces over four or five consecutive years will greatly reduce the damage done to timbers. Bug bombs and vapour fumigators are also effective at eradicating adult and larvae of many other insects including, fleas, cockroaches, flies and spiders. Note: for most insect pests additional treatments with residual products are required for ongoing control. These products work in enclosed spaces. The better sealed the space the more effective the products will be or the fewer bombs and fumigators are required. There are two types of bomb or fumigator; aerosols with a click down activation trigger and water activated vapour fumigators. 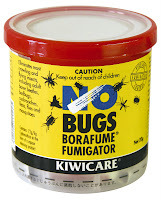 NO Bugs Bug Bomb or NO Bugs Borafume Fumigator - Read the instructions on the can and calculate the number of aerosols or fumigators you need for the areas you need to treat. The average house will need three for the rooms and one or two for roof voids. Sub-floors will depend on the height above the ground. Cover or remove fish and fish tanks. Have all people and pets vacate the areas. Close all doors and windows except those you will exit via. Seal any other ventilation points. Place all the aerosols or fumigators to be used on stable surfaces in the centre of the spaces to be treated. Fumigators get quite hot so place them on a heat resistant surface. Plan the order in which you well set them off and retreat from the areas so that you can set them off in sequence and exit the building after the final bomb is activated. Fumigators should have the fumigator foil wrapping opened and the correct amount of water added to the plastic reservoir cup. Aerosols - Set the bombs off by clicking down the activator firmly. The bomb should emit at stream of vapour. Depending on the temperature and humidity you may see the vapour more or less. Water Activated Fumigators - Place the fumigator in the water taking care to put the fumigator in the correct way up. The fumigator will emit vapour after approximately 1-2 minutes. Close and lock doors behind you as you exit. Stay out of the treated areas for at least 2-3 hours for the aerosol and at least 3 hours with the fumigator. Stay out longer if possible. Return to the house and open doors and windows to fully ventilate the treated areas. Remove any covers that have been placed over vents. You should now be free of adult insect pests in the treated areas, but remember that there is no residual effect from these products. We recommend the use of residual surface sprays for ongoing protection from most insect pests. Check out the advice for the pest bothering you on the main Kiwicare website. "I'm empty and my bug friends have left." The Bug Bomb fumed to the Borafume. Insecticide use in homes and gardens is at its peak at this time of the year. Flies, spiders, ants, cockroaches, fleas, bed bugs, aphids and others increase in numbers in the warm weather. There are a myriad of insecticide sprays and other products on the shelves of your supermarket, but how many people know which to choose and how and when to use them to the best effect? What we want is to have a home and garden free of pest insects and spiders, but we don't want to harm other creatures or ourselves. Over the next few blogs you will find a few tips on choosing the best product and how to use products in the most effective and safest way. There are three forms of fly spray; knockdown aerosol, automatic dispenser aerosol and surface residual spray. Knockdown aerosol insecticides quickly knockdown and kill flying insects in an enclosed space. The insecticide is usually a synthetic pyrethroid often with the synergist (effect enhancing) piperonyl butoxide. Cover or remove any fish tanks in the area. People and pets should vacate the room for the period suggested on the label. Usually an hour or more. The aerosol should be used in a short burst aiming upward in the middle of the room. They have little or no residual effect and once the room is ventilated after use insects may return. Automatic aerosol dispenser units overcome the lack of ongoing control from knockdown aerosols by automatically emitting a puff of insecticide at regular interavls so that there is insecticide in the atmosphere for significant periods over a day. Most of these products such as NO Insects AutoCan contain natural pyrethrum which has a shorter effective life than synthetic pyrethroids and is perceived as less likely to build up in the environment. This is important especially as the room/s are likely to be continually used while the insecticide is in the air. It is important that these units are sited away from food and food preparation areas. These products will be less effective in ventilated areas such as rooms with open doors or windows and will not work outside. Surface treatment residual sprays such as NO Flies Safe or NO Bugs Super are designed to remain effective for periods of several months. These are also synthetic pyrethroids in formulations that protect the insecticide from UV light. Surfaces where flies land such as window and door frames, window sills, walls, etc. can be sprayed. When the product dries the surfaces become lethal to insects, both crawling and flying. The great advantages of this type of product are that there is ongoing control but no insecticide in the atmosphere and they can be used effectively in ventilated spaces, even exteriors. Residual surface sprays can be used in food preparation areas; food and food utensils and surfaces should be covered or removed prior to treatment but can be returned once the spray is fully dry. The disadvantage of surface treatments for control of flying insects is they rely on flies landing on the treated surfaces. One species in particular; Lesser House Fly, is a small house fly that is often seen flying in angular flight patterns in the centre of a room. These flies may not land on surfaces all day and only land at night. NO Flies Safe targets such flies as it contains a fly pheromone that encourages house flies to land on the treated surfaces, killing them more quickly. When spraying surfaces it is important to give an even coverage. Spray until just before the spray begins to run on the surfaces. Over spraying can cause run marks and under spraying may reduce effectiveness. It is better to apply a second application rather than over spray on the first spray. If you have any questions on which product to use or how to use them, the team at Kiwicare is always happy to help. Send us an email or call us. Did you know you can seal concrete, masonry, brickwork, stone, terracotta, fabrics, leather, suede and other porous materials with the Kiwicare waterproofing range? These sealants prevent water penetration but still allow the materials to breathe allowing for evaporation and drying. The sealants will also help prevent staining and the growth of moss, moulds, mildews, slime and algae. They are ideal for use on paths, walls, driveways, terracotta pots, roofs, Oamaru stone work and others. NO Leaks Red Brick and Terracotta Sealer should be used on dark bricks and on terracotta such as flower pots. When used on the pots it will stop water penetrating and fracturing the terracotta on freezing, it also allows you to remove and transplant your pots more easily as it stops the soil and plant roots adhering the interior of the pot. Make your pot planting easy. There is something very satisfying about walking barefoot across a lush green lawn. On the other hand, a patchy, browned off, weed filled lawn can be something of an embarrassment and it certainly does not show off your house and garden to the best effect. There are some simple steps to beautiful attractive lawn. Get rid of the mosses. Mosses, lichens and liverworts may not be growing much at this time of the year but they can be removed by treating with a moss killer such as Mossclear and then raking the dead moss out with a grass rake. Moss is an indication that that area of the lawn is not well drained and is perhaps shaded by over hanging trees. Fork the area to improve drainage and cat away shading trees or shrubs. Don't cut your grass too short, give the grass a chance to shade out mosses and other low growing weeds. Get rid of broadleaf weeds. Dandelions, daisies, clovers, hydrocotyle, plantains and others can be selectively killed with lawn weedkiller such as NO Lawn Weeds Turfclean. Turfclean is specially formulated by Kiwicare to kill weeds without browning off the grass in the lawn as other lawn weedkillers can. Protect your lawn from damaging soil insects such as grass grub, cluster fly, porina and armyworm by using a slow release insecticide such as NO Insects Lawngard Prills. Green up your lawn and encourage healthy grass growth by watering well with a liquid fertiliser. Kiwicare's new Nourish Organic Fertiliser range is BioGro certified and will give excellent results quickly and without using harsh chemicals on the lawn that would stop the use of the lawn by pets or children. Finally, get out and enjoy your lawn. Anyone for cricket? At Kiwicare we have recently had several enquiries about how to deal with earwigs in the vegetable patch. 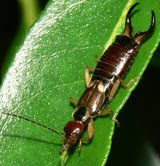 Earwigs are soil dwelling, usually flightless insects. They are easily identified by the large pincers at the end of the abdomen (see the photo opposite Courtesy of bramblejungle / flickr Creative Commons). Earwigs are omnivorous both hunting other insects and eating soft plant material like new shoots and soft leaves like those of your lettuce. They rarely do a lot of damage to crops but it can be off putting to find holes in your vegetables and earwigs in the hearts of your lettuce. You will not want to use chemical insecticides on your vegetables as these usually have a withholding period in which you should not eat the crop. However, as the earwigs are soil dwelling the soil between the vegetable can be treated with a slow release, non-systemic insecticide such as NO Insects Lawngard Prills. Lawngard Prills is used to control a range of soil dwelling pest insects including grass grub, porina, ants, cluster fly larvae, carrot rust fly, slaters and earwigs. The prills or granules should be sprinkled on the soil between and around the vegetables and fruit, taking care not to get them on the crop plants. Then water them well in. The insecticide penetrates the soil and controls insects in both the larval and adult stages. 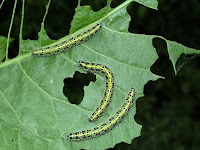 The season for white Cabbage Moth and Cabbage White butterfly caterpillars is late this year. But I am starting to see the white butterflies flitting about gardens now and this means that they have been laying their eggs on the vegetables. They go for plants such as cabbages, broccoli, Brussels sprouts and beetroot. There are also other caterpillars and grubs that attack our vegetables such as the larvae of the potato and tomato moth and the armyworm. All of these grubs attack and eat the leaves of various plants in the garden. Treatment with traditional insecticides to protect the veges and fruit would mean not being able to eat the crops for a withholding period. 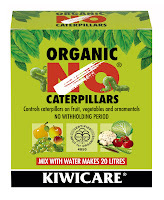 Kiwicare have recently released a BioGro certified organic product that controls caterpillars of all sorts without a withholding period. Organic Caterpillar Bio Control (previously Organic NO Caterpillars) controls pest insect caterpillars and other leaf eating larvae on fruit, vegetables and ornamentals. It is safe to handle, does not affect the plants or beneficial insect species but is deadly to plant damaging caterpillars when used as directed. It will control all types of caterpillars including leafroller, looper and white butterfly as well as diamond back moth larvae, tomato fruitworm, and fall webworm. Beneficial insects such as ladybirds and bees are not harmed. There has been a big spike in requests to Kiwicare for information on how to get rid of fleas. This time of the year usually sees an increase in flea activity but 2010 seems to have got off to a Big Bite of flea problems. The warm weather at this time of year encourages the reproduction of fleas and numbers can explode. Fleas emerge from their pupal cocoons as people return from holiday to homes where the fleas have been starved while the owners and their pets have been away. With the result that the people and the pets get bitten........big time. Fleas are associated with animals. Each animal, including humans, have a specific species of flea; cats have cat fleas, dogs have dog fleas, birds have bird fleas. In New Zealand it is almost always cat, dog or bird fleas that cause infestations in homes. Although each animal has its own flea, each species will take a feed from other mammals, including humans if necessary. Identify the source of the problem - pet/s, bird nest in roof etc. Treat your affected pets with a proprietary flea control product from your vet or pet shop. If you are brave you can vacuum thoroughly now. Vacuuming encourages any pupae to hatch so the the hatched fleas are killed by the insecticide you will apply next. It also removes the dust and detritus that the flea larvae would feed on. Be sure to dispose of the vacuum bag immediately afterwards, by sealing in a plastic bag and placing in the waste bid outside. But, I say 'brave' because the first thing flea adults will want to do is find food. This is likely to be your blood. So you may wish to skip this section and go to 3. Knock down the adult population of fleas with a flea bomb such as the NO Bugs Bug Bomb. Spray the areas of the house where fleas have been seen and where the pets sleep using a residual insecticide containing an insect growth regulator, i.e. NO Fleas Total. You should also spray outside areas where pets sleep. After 5-7 days, vacuum, vacuum and vacuum again. This removes dead adults and larvae and encourages any pupae to hatch so the the hatched fleas are killed by the insecticide. It also removes the dust and detritus that the flea larvae would feed on. Be sure to dispose of the vacuum bag immediately afterwards, by sealing in a plastic bag and placing in the waste bid outside. For ongoing protection spray again after several days. Stay free from those flea bites. The flea said to his girlfriend. "Let's go out for a bite." With the warm summer weather come ideal conditions for our insect pests. Cockroaches, ants, flies, wasps, aphids, etc. All will be increasing their populations and activity. Cockroaches in particular love the warmth and humid climate of the north of the North Island. There are four species of cockroach that commonly infest homes; German, American, Gisborne and native Bush cockroaches. If you have seen cockroaches scurrying around your kitchen at night when you turn the lights on you may be able to identify which species it is by looking at the useful key provided by Landcare Research here. As you will see, the Bush and Gisborne are easily mistaken but the native Bush cockroach is much smaller when adult and rarely gets more than 15mm long. It is also less likely to live in a house but will come in from outside leaf litter. Treatment of a cockroach infestation can be difficult because the eggs and egg cases are often laid in difficult to treat cracks and crevices. Egg cases also provide protection from insecticides. Therefore, it is important that treatment is maintained for at least one month after you stop seeing cockroaches. If you have had an infestation of cockroaches your home will continue to be susceptible. Keep NO Cockroaches Traps set in your kitchen and other places you have seen cockroaches. These BioGro certified organic traps contain no insecticide and will catch cockroaches that enter your home before they have a chance to lay eggs and start a new infestation. They also provide you with an warning of cockroaches getting into the house so that you can pro-actively treat with a residual insecticide like NO Cockroaches or NO Bugs Super Professional Strength and prevent a problem infestation. It's 2010. Wow, where did 2009 and the noughties go? What are we going to call this new decade? We can't call them the teenies for three years. Pre twenties? Oneties? Oh well i will leave that for others to come up with something that catches on. What ever we call this decade Kiwicare hopes you have a good one and grow with us as New Zealand's fastest growing manufacturer of garden home and care products. Why did the centipede not play 'til the second half in the insect soccer match? Because it it took that long to get his boots on. The millipede didn't play until the final.